What can be stored on OneDrive? OneDrive is Xavier University's officially supported cloud storage, allowing you to share and collaborate on documents with colleagues as well as those outside Xavier. It is very similar to other cloud storage providers, such as Google Drive, or Dropbox. You can store a total of 1 TB of files on your OneDrive! You can store up to 1 TB worth of documents in OneDrive, with a 10 GB file size limit. 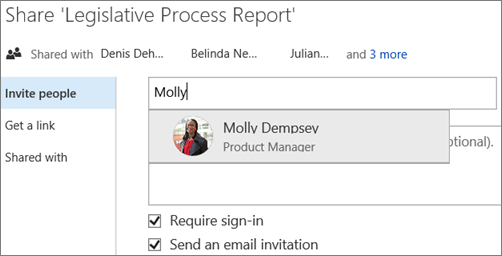 We recommend that you refrain from storing any departmental data on OneDrive. Faculty and staff should always use Sharepoint or the R drive for collaborative sharing of department materials, especially sensitive items. Log in using your Xavier credentials. Click in the upper-left corner, and then click the OneDrive icon. In the toolbar, click on Upload. Choose the file you wish to upload, and click Open. The file will be uploaded and added to your OneDrive file list. Alternatively, you can also drag-and-drop a file directly onto the OneDrive page. Watch a video that demonstrates the above steps. By default, files you upload to OneDrive are private until shared with others. There are several methods to share a document. You can quickly share a web link to a specific document, with the caveat that anyone you share that link with can likewise share it with others. For more fine-grained control, you can target specific individuals by sending a sharing invitation. 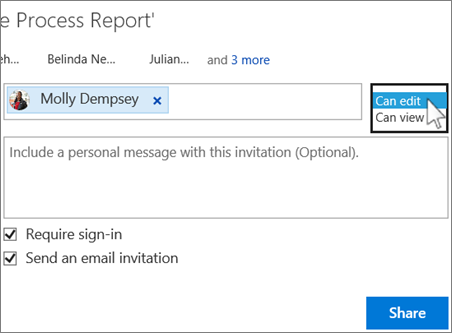 You can quickly share a link to a document that others can also share by using Get a link. Get a link is available only for individual files, but it’s the easiest way to share with everyone in your organization or to share with people externally. Right-click on the file in OneDrive, and select Get a Link from the menu. Select an appropriate level of access from the list. You can grant Edit or View-only access. Edit or View links can optionally be created as Guest links, which allow those outside Xavier to access the document. You can optionally set a link to expire after a certain period by clicking on Set Expiration. The link created can then be copied and pasted into an email, IM, Canvas course, etc. Right-click the file or folder you want to share, and then select Share. Choose to grant Edit or View permissions from the pulldown menu on the right. If you want, type a message to be included with an email that’s sent to all invitees. The email includes a link to the shared document. The One Drive app is available for all major computing platforms. To download, visit https://onedrive.live.com/about/en-us/download. Hoonuit (formerly Atomic Learning) has a selection of short online video tutorials on all aspects of Office 365. Section D of this series covers OneDrive.